A cholesteatoma consists of squamous epithelium that is trapped within the skull base and that can erode and destroy important structures within the temporal bone. Its potential for causing central nervous system (CNS) complications (eg, brain abscess, meningitis) makes it a potentially fatal lesion. See the image below. A large cholesteatoma. No landmarks are visible, which typically is the case with advanced cholesteatomas. No laboratory tests or incisional biopsies are generally necessary for the diagnosis of cholesteatomas, because the diagnosis can be made based on physical examination and radiologic findings. Computed tomography (CT) scanning is the diagnostic imaging modality of choice for these lesions, owing to its ability to detect subtle bony defects. Histologically, surgically removed cholesteatoma specimens demonstrate typical squamous epithelium. The histology is indistinguishable from that of sebaceous cysts or keratomas removed from any other portion of the body. Audiometry should be performed prior to surgery whenever possible. Air and bone conduction, the speech reception threshold, and speech discrimination scores should all be determined within a few weeks of the proposed operative procedure. Virtually all cholesteatomas should be excised. The only absolute contraindications to the surgical removal of cholesteatomas are medical in nature. In the canal wall–down (open) procedure, the posterior canal wall is removed. A large meatoplasty is created to allow adequate air circulation into the cavity that arises from the operation. Canal wall–down operations have the highest probability of permanently ridding patients of cholesteatomas. In the canal wall–up (closed) procedure, the canal wall is preserved. Canal wall–up procedures have the advantage of maintaining a normal appearance, but the risk of persistent or recurrent cholesteatomas is higher than in the canal wall–down operation. Epitympanic (attic) cholesteatoma. This is a typical primary acquired cholesteatoma in its earliest stages. A congenital cholesteatoma. A white mass can be seen behind an intact drum. Throughout the early half of the 20th century, cholesteatomas were managed by exteriorization. The mastoid air cells were exenterated, the posterior wall of the external auditory canal was removed, and the opening into the resulting cavity was enlarged to ensure adequate air exchange and to make visual inspection simple. A cholesteatoma consists of squamous epithelium that is trapped in the skull base. Squamous epithelium trapped within the temporal bone (ie, middle ear or mastoid) can expand only at the expense of the bone that surrounds and contains it. Consequently, a growing cholesteatoma can erode and destroy important structures within the temporal bone. Occasionally, a cholesteatoma escapes the confines of the temporal bone and skull base. Extratemporal complications can occur in the neck, CNS, or both. When a cholesteatoma within the cranium grows large enough to produce mass effect, brain dysfunction can develop. Generally, the following 3 types of cholesteatoma are identified: congenital, primary acquired, and secondary acquired. As they expand, congenital cholesteatomas can obstruct the Eustachian tube and produce chronic middle ear fluid and conductive hearing loss. They can also expand posteriorly to encase the ossicular chain and, by this mechanism, produce conductive hearing loss. A second type of primary acquired cholesteatoma arises when the posterior quadrant of the tympanic membrane is retracted into the posterior middle ear. The drum initially adheres to the long process of the incus. As retraction continues medially and posteriorly, squamous epithelium envelops the superstructure of the stapes and retracts into the sinus tympani. Primary cholesteatomas arising from the posterior tympanic membrane are likely to produce facial nerve exposure (and occasionally paralysis) and destruction of the stapedial superstructure. Surgical removal from the sinus tympani may be extremely challenging. 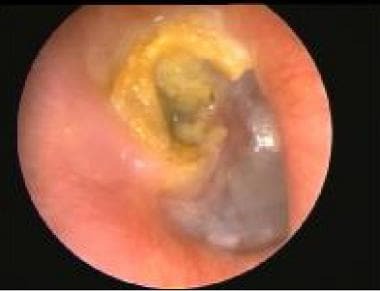 Secondary acquired cholesteatomas result directly from an injury to the tympanic membrane. This injury can be a perforation caused by acute otitis media or trauma, or it may be due to surgical manipulation of the drum. The incidence of cholesteatomas in the United States is unknown, but they are a relatively common reason for otologic surgery (approximately weekly in tertiary otologic practices). Death from intracranial complications of cholesteatoma is now uncommon, with the change being attributable to earlier recognition, timely surgical intervention, and supportive antibiotic therapy. Cholesteatomas remain a relatively common cause of permanent, moderate conductive hearing loss in children and adults. Eliminating a cholesteatoma is almost always possible; however, multiple operations may be required. Because surgery is generally successful, complications from uncontrolled cholesteatoma growth are now relatively uncommon. Nonetheless, because the ossicular chain and/or tympanic membrane cannot always be completely restored to normal, cholesteatomas remain a relatively common cause of permanent, moderate conductive hearing loss. Death from intracranial complications of cholesteatoma is now uncommon, with the change being attributable to earlier recognition, timely surgical intervention, and supportive antibiotic therapy. De la Cruz A, Fayad JN. Detection and management of childhood cholesteatoma. Pediatr Ann. 1999 Jun. 28(6):370-3. [Medline]. Janet C, L CS, L JA, A GK, C PB. Congenital cholesteatoma and cochlear implantation: Implications for management. Cochlear Implants Int. 2012 Mar 2. [Medline]. Lim HW, Yoon TH, Kang WS. Congenital cholesteatoma: clinical features and growth patterns. Am J Otolaryngol. 2012 Feb 21. [Medline]. Stapleton AL, Egloff AM, Yellon RF. Congenital cholesteatoma: predictors for residual disease and hearing outcomes. Arch Otolaryngol Head Neck Surg. 2012 Mar. 138(3):280-5. [Medline]. Joel Swartz, H. Harnsberger. Imaging of the Temporal Bone. 3 Sub edition. New York: George Thieme Verlag; Oct 1, 1997. Roland PS, Meyerhoff WL. Open-cavity tympanomastoidectomy. Otolaryngol Clin North Am. 1999 Jun. 32(3):525-46. [Medline]. Graham MD, Delap TG, Goldsmith MM. Closed tympanomastoidectomy. Otolaryngol Clin North Am. 1999 Jun. 32(3):547-54. [Medline]. Koizumi H, Suzuki H, Ohbuchi T, Kitamura T, Hashida K, Nakamura M. Increased permeability of the epithelium of middle ear cholesteatoma. Clin Otolaryngol. 2015 Apr. 40 (2):106-14. [Medline]. Rosito LPS, Canali I, Teixeira A, Silva MN, Selaimen F, Costa SSD. Cholesteatoma labyrinthine fistula: prevalence and impact. Braz J Otorhinolaryngol. 2018 Mar 9. [Medline]. [Full Text]. Potsic WP, Korman SB, Samadi DS, Wetmore RF. Congenital cholesteatoma: 20 years' experience at The Children's Hospital of Philadelphia. Otolaryngol Head Neck Surg. 2002 Apr. 126(4):409-14. [Medline]. Lee CH, Kim MK, Kim HM, Won C, Shin TH, Kim SY. Bilateral Congenital Cholesteatoma. Otol Neurotol. 2018 Apr 11. [Medline]. Morita Y, Yamamoto Y, Oshima S, Takahashi K, Takahashi S. Pediatric middle ear cholesteatoma: the comparative study of congenital cholesteatoma and acquired cholesteatoma. Eur Arch Otorhinolaryngol. 2016 May. 273 (5):1155-60. [Medline]. Kemppainen HO, Puhakka HJ, Laippala PJ, et al. Epidemiology and aetiology of middle ear cholesteatoma. Acta Otolaryngol. 1999. 119(5):568-72. [Medline]. Golz A, Goldenberg D, Netzer A, et al. Cholesteatomas associated with ventilation tube insertion. Arch Otolaryngol Head Neck Surg. 1999 Jul. 125(7):754-7. [Medline]. Drahy A, De Barros A, Lerosey Y, Choussy O, Dehesdin D, Marie JP. Acquired cholesteatoma in children: Strategies and medium-term results. Eur Ann Otorhinolaryngol Head Neck Dis. 2012 Apr 2. [Medline]. van der Toom HFE, van der Schroeff MP, Pauw RJ. Single-Stage Mastoid Obliteration in Cholesteatoma Surgery and Recurrent and Residual Disease Rates: A Systematic Review. JAMA Otolaryngol Head Neck Surg. 2018 Mar 15. [Medline]. Rosito LS, Netto LS, Teixeira AR, Costa SS. Sensorineural Hearing Loss in Cholesteatoma. Otol Neurotol. 2016 Mar. 37 (3):214-7. [Medline]. Yehudai N, Most T, Luntz M. Risk factors for sensorineural hearing loss in pediatric chronic otitis media. Int J Pediatr Otorhinolaryngol. 2015 Jan. 79(1):26-30. [Medline]. Manolidis S, Kutz JW Jr. Diagnosis and management of lateral sinus thrombosis. Otol Neurotol. 2005 Sep. 26(5):1045-51. [Medline]. Djurhuus BD, Skytthe A, Faber CE, et al. Cholesteatoma risk in 8,593 orofacial cleft cases and 6,989 siblings: A nationwide study. Laryngoscope. 2014 Nov 12. [Medline]. Thompson JW. Cholesteatomas. Pediatr Rev. 1999 Apr. 20(4):134-6. [Medline]. Tierney PA, Pracy P, Blaney SP, Bowdler DA. An assessment of the value of the preoperative computed tomography scans prior to otoendoscopic 'second look' in intact canal wall mastoid surgery. Clin Otolaryngol Allied Sci. 1999 Aug. 24(4):274-6. [Medline]. Gaurano JL, Joharjy IA. Middle ear cholesteatoma: characteristic CT findings in 64 patients. Ann Saudi Med. 2004 Nov-Dec. 24(6):442-7. [Medline]. Manasawala M, Cunnane ME, Curtin HD, Moonis G. Imaging Findings in Auto-Atticotomy. AJNR Am J Neuroradiol. 2013 Nov 14. [Medline]. Vercruysse JP, De Foer B, Pouillon M, et al. The value of diffusion-weighted MR imaging in the diagnosis of primary acquired and residual cholesteatoma: a surgical verified study of 100 patients. Eur Radiol. 2006 Mar 3. [Medline]. Dubrulle F, Souillard R, Chechin D, et al. Diffusion-weighted MR imaging sequence in the detection of postoperative recurrent cholesteatoma. Radiology. 2006 Feb. 238(2):604-10. Muzaffar J, Metcalfe C, Colley S, Coulson C. Diffusion-weighted magnetic resonance imaging for residual and recurrent cholesteatoma: a systematic review and meta-analysis. Clin Otolaryngol. 2016 Oct 4. [Medline]. Yamashita K, Hiwatashi A, Togao O, et al. High-resolution three-dimensional diffusion-weighted MRI/CT image data fusion for cholesteatoma surgical planning: a feasibility study. Eur Arch Otorhinolaryngol. 2014 Dec 28. [Medline]. Kobayashi T, Gyo K, Komori M, Hyodo M. Efficacy and Safety of Transcanal Endoscopic Ear Surgery for Congenital Cholesteatomas: A Preliminary Report. Otol Neurotol. 2015 Dec. 36 (10):1644-50. [Medline]. Hunter JB, Zuniga MG, Sweeney AD, et al. Pediatric Endoscopic Cholesteatoma Surgery. Otolaryngol Head Neck Surg. 2016 Mar 1. [Medline]. Dawes PJ, Leaper M. Paediatric small cavity mastoid surgery: second look tympanotomy. Int J Pediatr Otorhinolaryngol. 2004 Feb. 68(2):143-8. [Medline]. Prinsley P. An audit of 'dead ear' after ear surgery. J Laryngol Otol. 2013 Nov 11. 1-7. [Medline]. Jindal M, Riskalla A, Jiang D, Connor S, O'Connor AF. A systematic review of diffusion-weighted magnetic resonance imaging in the assessment of postoperative cholesteatoma. Otol Neurotol. 2011 Oct. 32(8):1243-9. [Medline]. Visvanathan V, Kubba H, Morrissey MS. Cholesteatoma surgery in children: 10-year retrospective review. J Laryngol Otol. 2012 Feb 6. 1-4. [Medline]. Osborn AJ, Papsin BC, James AL. Clinical indications for canal wall-down mastoidectomy in a pediatric population. Otolaryngol Head Neck Surg. 2012 Aug. 147(2):316-22. [Medline]. Roth TN, Haeusler R. Inside-out technique cholesteatoma surgery: a retrospective long-term analysis of 604 operated ears between 1992 and 2006. Otol Neurotol. 2009 Jan. 30(1):59-63. [Medline]. Sanna M, Facharzt AA, Russo A, Lauda L, Pasanisi E, Bacciu A. Modified Bondy's technique: refinements of the surgical technique and long-term results. Otol Neurotol. 2009 Jan. 30(1):64-9. [Medline]. Walker PC, Mowry SE, Hansen MR, Gantz BJ. Long-Term Results of Canal Wall Reconstruction Tympanomastoidectomy. Otol Neurotol. 2013 Oct 16. [Medline]. Busaba NY. 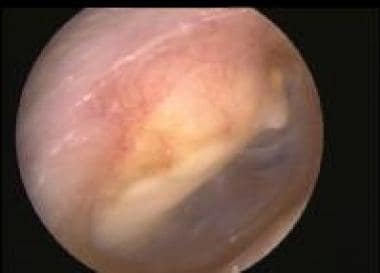 Clinical presentation and management of labyrinthine fistula caused by chronic otitis media. Ann Otol Rhinol Laryngol. 1999 May. 108(5):435-9. [Medline]. A large epitympanic (attic) cholesteatoma that is much more advanced than the lesion in the previous image. An unenhanced computed tomography (CT) scan demonstrating that the posterior canal wall has been eroded and the external auditory canal has filled with cholesteatoma, pus, and debris. Surprisingly, the middle ear appears relatively free of disease, a characteristic of primary acquired cholesteatomas. The photo exhibits a large meatoplasty performed as part of an open cavity (canal wall–down) mastoidectomy. A similar meatoplasty usually is necessary if a clean, dry, problem-free cavity is to be maintained. A typical audiogram demonstrating bilateral conductive hearing loss, which may be observed in an individual with a cholesteatoma. The author is grateful for the expert help of Pam Henderson in the preparation of this manuscript.